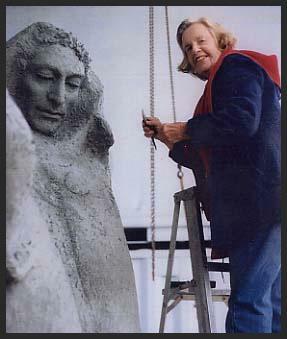 Harriet G. Moore working on the 9 1/2 ft. version of St. Francis. The eventual bronze was donated in 2002 to the city of Assisi, where it stands in a public square. Harriet G. Moore was born in New York City in 1920. As a child, she was strongly encouraged to pursue her interest in sculpting and attended private progressive schools with a heavy emphasis on the arts. From 1938 to 1942, she attended Bennington College in Vermont, majoring in sculpture. She spent a nonresident junior year in Mexico City, studying stone carving with Luis Ortiz Monasterio. After graduating from Bennington, she studied modeling the figure and portrait with Jose de Creft at the Art Students League in New York City. Harriet married in 1945, living in New York City until 1952. She then moved to Westfield, NJ, where she lived for the next 24 years, raising 3 children. In 1976, she moved to San Francisco and still resides in the Bay Area. Harriet has completed more than 50 commissioned portraits of private individuals and public or historical persons, for public places on both the East and West coasts and overseas. Her media include bronze, terra-cotta, wood, and stone, as well as prints and drawings. Dante is “rapt” by an eagle, bronze, 34″ tall. Her major oeuvre for 20 years has been an interpretation of Dante’s Divine Comedy in paintings and sculptures exhibited in NYC and at San Francisco’s Grace Cathedral, Fort Mason, Vorpal Gallery, and the Shrine of Saint Francis. See Harriet Moore Paintings and Sculptures of the Comedy at research.bowdoin.edu. Other works include: Hygeia, Goddess of Healing, in marble, and Florence Nightingale in bronze, both at UC Medical Center. She created Angels for the sanctuary at St. Boniface Church and recently, busts of Rev. Cecil Williams and poet Janice Mirakitani in terra-cotta. One of her latest work was the permanent placement of a 9 1/2′ bronze statue of Saint Francis in Assisi, Italy. An unveiling took place in October of 2002. She had been working on plans for a 2nd St. Francis for the city of San Francisco, with the help of Artists Embassy International, the Sister City Committee, and the Director of Museo Italo Americano. However, health conditions prompted Harriet to retire from engagement in her work in 2010. She passed away on August 2, 2018, just two months shy of the proud age of 98. To learn more about the artist, please visit a display of her more extensive portfolio on David G. Moore’s photography site. East Bay Times reports on Harriet Moore’s studio and backyard. SF Gate reports on Harriet Moore’s large bronze sculpture of St. Francis.